Plainville Boat Shop has been in business for over 50 years. It was started in 1953 by Bill & Bertha Cates who worked on and sold boats as a couple until 1991 when Doug and Pam Emerick purchased the business and are running it today. 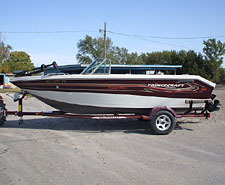 Plainville Boat Shop is located 23 miles north of Hays Kansas I-70 and is on west highway K-18 in Plainville, Kansas. It is located in the heart of the six lakes of Northwest Kansas - Webster, Cedar Bluff, Norton, Kirwin, Glenn Elder and Wilson. We have loyal customers from all across the U.S. and Canada and are an E-bay power seller with a 100% positive rating. We are avid boaters ourselves and want you to have the best possible boating experience. Be sure to contact us when you are ready to purchase a new or used boat.